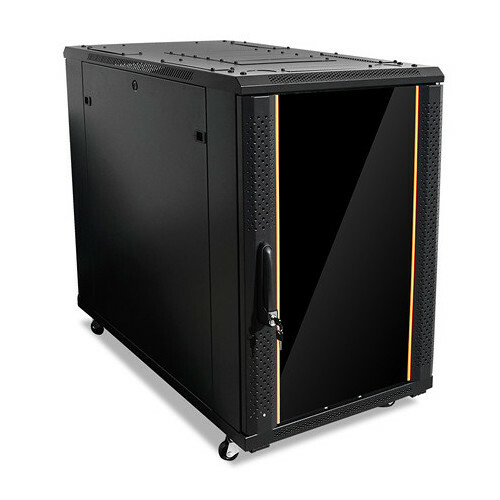 Supports Chassis Depths up to 32"
The iStarUSA Claytek WNG1810-PD10 is an 18 RU knock-down server cabinet with a 10-outlet overload protection PDU designed to house standard 19" rack equipment for technicians and engineers in network applications, lab and test systems, and server installations. It accommodates chassis depths up to 32" and supports rack rails for up to 18 RU of gear. The mounting rails are adjustable to provide optimal compatibility with various rackmount devices. The welded steel frame is ready to assemble and handles a loading capacity of 1700 lb. The perforated rear door and strengthened glass front door utilize security key locks to prevent unauthorized equipment access. Cable entry points in the top, bottom, front, and back enable tidy wire management, and removable side panels with latches provide convenient access for maintenance. Built-in vents plus the rear-door perforations allow airflow to minimize equipment overheating. The overload circuit breaker protection PDU occupies 1 RU and offers ten outlets.